Highway Patrol responded to an accident that occured shortly after 12 o’clock Saturday afternoon .3 miles west of Montezuma, KS. 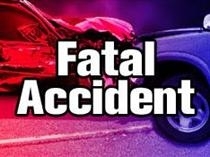 James P. Kellner, 21, of Montezuma, was northbound on County Road 9 when his 1998 Chevrolet truck hit another vehicle coming from the opposite direction. Kellner was killed in the crash. The other vehicle was a 1989 International truck that was hauling a trailer. The two occupants inside were David Teichroeb, 20, and Tyler Koehn, 11, who were also from Montezuma. No one in the second vehicle was injured.